We had to prepare a short speech which would be recorded and shown to all homeroom classes. I remember cringing so much when I saw how mine turned out. I didn't always look directly at the camera and I read it awkwardly since I was kinda nervous. My opponent's speech wasn't amazing either. At least we got off on an equal foot. When it was time to vote, I can confidently say that almost everyone in my homeroom class voted for me.It is a small class anyways (it only has 12 kids), and everyone said they voted for me except for two people. All of my friends voted for me. Some people in the hall would walk up to me and said they chose me. Some of them said they voted for me simply because they didn't have much of a choice otherwise. But hey, any type of support is good support. So today, at around 2:00, when I was still in art class at the end of the school day, there was an announcement over the loudspeakers telling the people who ran for student council to come to a certain room. That's where they gave the results. Apparently, only one 8th grader even bothered to run for vice-president, so they automatically won their role. President for eighth grade was going to be announced later. The only question that they could answer at the moment was who won 7th grade vice-president. At least it wasn't a total loss. They told me that the vote margin was very close, and that they would still allow me to have a role in student council. I would be the secretary. So even though I can't be vice-president, I will still get to be secretary. Basically that means that I will attend meetings and gather ideas from the council to tell to the other representatives. 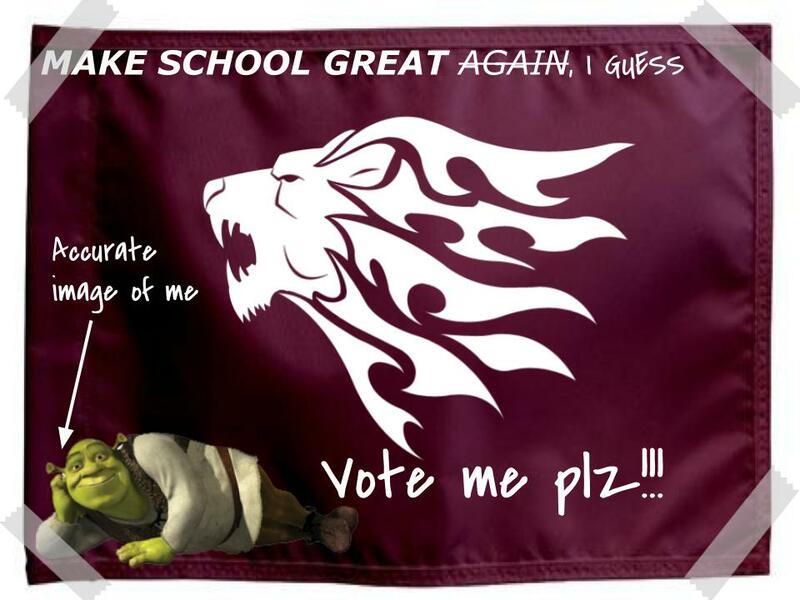 Even though I failed to make my school great again, I can still make my blog great again. It is at 64 thousand views, far beyond my previous goal of 50 thousand views. I promised you guys that I would make a silver Blogger award out of clay and feature it in a special post. I have not yet done so. This weekend, I won't be busy, so I may be able to head to Michael's to get the supplies and then type up the special post for it. Summer is almost here, and there are only four more days of school left. Thursday, June 22, is my last day of school. During the summer, I will make at least one post a day (except when I'm on vacation in Turkey). Once school ends, I will give my blog a mega upgrade. I will release upgrade 7.0, which will be so much better than 6.0 (which did nothing). My entire blog template will look more professional, cooler, and there will be a "read more" button for every post so you don't have to scroll down forever to find other posts you want to read. My next post will be on Thursday, when school ends. Until then, BBBYYYYYYYEEEEEEE!!! Yes, Xiang. I know you voted for the other person. lol i knew i would win anyways, and it was just a joke. I never thought I would lose. At least the margin was close.